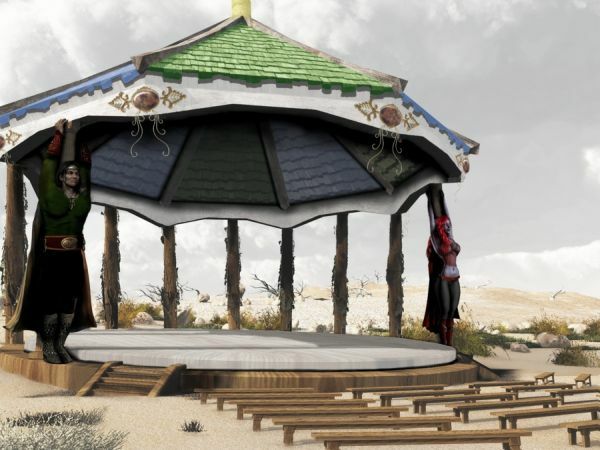 Throughout history the Amphitheater always remained in the Arena, but on the 26th year by the order of the Emperor Stormbringer a new amphitheater was to be built and people were asked to donate in return of reserved seats either by money or work to construct the new theater. Nicholas Shade was away on an exotic journey with his harem while Tehya now Imperial Bard took on the project gathering as many donors to contribute and work on the amphitheater. It is a grand amphitheater; unique in design having a multi-colored roof, a rotating stage, and columns of carved figures, one being the Emperor himself, the consort, and some of the nobles. The amphitheater is round and has a unique rotating stage with the mechanism designed and put together by Famfrit. All of the wood carved figures were done by Kuromaku, and hand painted by Tehya. The roof is painted in green and white stripes outlined in silver, the colors of the Empire, and has large multi-colored gems embedded in each panel along the roof’s edge. The seats are portable with the intention of breaking down the amphitheater when needed, to store away in bad weather, or to be moved to a special location for a scheduled event. A team of the finest horses provided by the Emperor are decorated in the Empire colors, with silk blankets embroidered with the crest, and their manes braided with silver ornaments of small lightning bolts attached to each braid. On July 13th the amphitheater was opened with the grand opening for the first show hosted by Tehya. Paid ushers escorted guests to their permanently reserved front row seats. The main contributors each received two seats permanently for themselves and one guest. Their names are carved into the seats, and embossed in gold leaf. The contributors include, the Emperor and his consort, Lord Ryo, Famfrit, Kuromaku, Atis`dai, Keegan, Gilgilgan, Devon, MorganDrakewing, Sorgram, Menhir, Sikyat, and Vilaria. The first group of performers included Fionnuala, Gabrieli, Tarin, Devryn, lyllamarie, and of course the master of ceremony herself Tehya. The first announcement to echo beneath that amphitheater roof was announced with pride, and with support and funding from the Empire and community. “Ladies and Gentleman on behalf of our Emperor Stormbringer this amphitheater opens on the 26th year of the Ilfirian Empire. The funding for this construction has come from the Emperor Stormbringer, royals and people of the land. In behalf of the Emperor Stormbringer, and by the urging of my former teacher Nicholas Shade and all of your help it pleases me to announce today the 13th day of June the grand opening of our amphitheater. To this day the amphitheater is available for bards and entertainers to practice, meet, and to be transported to any special event.